If any company or persons, like Insurance Companies, Bankers, Doctors, or Automobile Corporation Executives (to give a few examples) dare to be profit-minded, or gain too much riches or power, they are automatically greedy, unethical, and immoral, according to the Left. However, if you are a Democratic Politician trying to nationalize America with government-run programs, which in turn will solidify the power of the politicians in place, that is perfectly fine, and moral. The loss of liberty to the American People is a necessary piece of collateral damage, according to the leftists. No big deal. Uncle Sam, or should that be Uncle Barry, taking control of everything is for your own good . . . or at least that is what the Democrats say. Anyone opposing the Liberals are the bad guys. Immoral villains, you could say (or in my case, a crazy rightwing extremist). "It's almost immoral what they are doing. Of course they've been immoral all along in how they have treated the people that they insure. They are the villains. They have been part of the problem in a major way. They are doing everything in their power to stop a public option from happening." I am not saying that the insurance companies are a bunch of angels. And I truly believe that insurance companies are a large part of the problem. Putting anyone between the patient and the provider is a bad idea. But rather than attack the insurance companies, why don't the Democrats address the real problem: Trial Lawyers? Instead of creating a massive government-run system that wreaks of Marxism, how about Tort Reform instead, which would ensure that frivolous lawsuits suing the doctors for even hiccuping wrong would come to an end? The answer, my friends, is not because the Democrats wish to improve health care. The answer is that the Democrats wish to replace those immoral, unethical, power hungry insurance companies with themselves, so that they can be the immoral, unethical, power hungry controllers of the American People. As the Obama Birth Certificate argument reaches the mainstream, and while the Left argues the issue should be over and done with because it has been proven that Obama was born in Hawaii, while the Right argues Barack Hussein Obama may very well not have been born in Hawaii, I propose a third possibility: Despite his birth place, Obama is not eligible because of his dual allegiance, which exists because he does not fall within the parameters of being a Natural Born Citizen of the United States of America. To understand this argument, one must understand the term, Natural Born Citizen. Breaking it down, let us first think about the first word, "Natural." The founders used Natural for a specific reason. Natural means, basically, not of man. So, natural would be a condition that happens outside of law, since law is something created by man. Therefore, simply being a citizen by legal means, like naturalization, does not make one a "Natural" born citizen. The word "Born" pertains to birth. Birth is important not just because of the "where," but because of the "who." Birth is the natural way to be a citizen, outside of the law, giving both place, and parentage, an important role. "Citizen." A citizen is someone belonging to a particular nation. To be naturally born as a citizen means the person must be a citizen by birth, and by means outside of man's law. In American society during the time of the founding of this nation, it was not only important to be born in America. Loyalty was an important factor. Dual loyalty was a dangerous thing, especially during a time of revolution. Therefore, a man with a father that was not born in America, but of British birth, would be considered to have dual allegiance. So, in addition to being born in the colonies, and later the states, one's father must have been born an American as well. Women were, at the time, not as important of a factor. Heirs are sons of their fathers. Citizenship was something, in a sense, you inherited from your father. So, to be a Natural Born Citizen was a person born in America of an American father. Later, as the importance of women grew in society, it became important that a person was the child of two American parents in order to be a Natural Born Citizen. One reader has repeatedly asked what court cases support my argument, as if the judiciary is the end all of legal matters. Before 1803 the courts were not the arbiters of the U.S. Constitution, and were not originally meant to be. The creeping incrementalism of an ever increasingly powerful judiciary followed to the point that today people think the decisions of 9 people in black robes should always overpower the decisions of the Legislative Branch, the Executive Branch, and the People. The founding fathers never intended for the courts to have that kind of power, which is why law was not made by the courts when these questions arose. In fact, often times they depended on common law which was enforced by the people's actions and voting tendencies. In the case of a Natural Born Citizen, it was apparent to the founders what was meant by the term, so little was done to clarify it. This is not to say there were not writings, and some legal clarifications made. I am only saying that a lot of explanation was not presented because the founding fathers felt that the words, "Natural Born Citizen" was clarification enough. Now, we find ourselves living with a liberal slant to our society, and with a liberal interpretation of the U.S. Constitution that basically says, "It means what we say it means by our own definition." I prefer to stick with the original intentions of the founding fathers. With all of this said, it becomes apparent to me that by the very fact that Barack Obama's father was born in Kenya, and held a Kenyan loyalty, Barack Obama does not fit the definition of Natural Born Citizen. In short, even though I still believe there is something fishy going on regarding Barack Obama's Birth Certificate, in the end it really doesn't matter. Obama did not inherit Natural Born Citizenship from his father because it was not his father's to give. If Obama's father had been born on American soil, despite a Kenyan lineage from his grandfather, then it would be an entirely different situation. But in the case of our current President, Obama's father was born in the nation of Kenya, making the elder Obama a non-American. When does behavior research become behavior modification? Simply put, in today's political environment, if you do not agree with liberalism, then there must be something wrong with you. As a result, the powers that be (the Democrats) wish to study your behavior patterns so that they can modify them in order to make you think more like them. Does that sound like science fiction? All of us are guilty of saying that there is something wrong with the world today. I am a firm believer that we have moved away from the original intention of the U.S. Constitution, and as a society we suffer from a secular-humanistic drive to immobilize morality, as well as any code of standards that could have anything in common with religion, especially Christianity. In other words, morality based on biblical standards has become a bad thing. The folks on the Left disagree with me on what is wrong, but like me, believe that in one way, or another, we are doing it all wrong when it comes to government and society. It doesn't matter that we also disagree with each other on what is wrong, or how to fix it. All that matters for the point of this argument is that each and every one of us believes that something is wrong, and to become a better nation it needs to change. Behavioral science has pinpointed that people like change, and they like to follow change when they think everyone else is doing it too. Hence, the basics on how Obama got elected. After the successful demonization of the previous administration, and the constant hammering on the American People that anyone that did not believe in Obama's change really didn't want any kind of change, which meant by default they wanted the same old politics of the past, which had been successfully hammered on as a failure; Obama not only won the election, but with a rabid following that was eerily devotional on a near-religious level. Now that the Democrats have control, they could care less about pesky little things like the U.S. Constitution, or anyone that dares to disagree with them. Dissent is but a minor obstacle. Obama's team has set out to make the changes Barack promised. Problem is, the "change" he wants is not anything like the "change" many of his devotees expect. His change is more than anyone could have ever believed possible. Barack Obama's hope and change is a well orchestrated change to the American Form of Government from a Republic, to a Socialistic Democracy. he Obama team, however, has this slight little problem. Not everyone mindlessly fell for his rhetoric. Believe it or not, there are those out there that actually disagree with him, and believe what he is doing is potentially harmful to not only the America of today, but to the America we hope to give to our children, and grandchildren. No problem, says the Democrats. Label them right-wingers as anti-government extremists, get the people to turn on them, and then use behavior research and modification methods to ensure the people begin to believe and act as the government desires. Excuse me, could George Orwell please stand up, and step up here to the front? It seems your nightmare, Mr. Orwell, is coming true after all. Where is Winston when we need him? What is especially sneaky about this plan of behavior research is it will be used under the guise that these researchers, and government, knows what is best for the collective, and to not follow the findings of this research that will be enacted upon the passing of H.R. 3247, you will be found to be against change, against growth, and against the betterment of society. Off to a re-education camp to you. Are you are phobe? Your time is coming. Islamophobes, Homophobes, Environmentalism-phobes, and Hope and Change Phobes, you are the true enemy, and President Obama's Brownshirts will ensure you cooperate and integrate. Otherwise, you are an enemy of the state. H.R. 1913 Hate Crimes legislation will be the law that allows the government to lock you away. H.R. 3247 will determine you are an obsolete citizen that is not willing to play ball. The Health Care legislation will determine who lives and dies by who gets treatment - and guess you doesn't get the medical care they need to survive? It will get to the point that any opinion of dissent will not be allowed, and will be forced to be stricken from the record. Don't believe me? Think I am being paranoid? Ken Calvert, California U.S. Representative, had a few things to say about the Left's health care plans in his newsletter, and the Democrats made him remove an Obama quote from it. How dare he not follow their lead. How dare he have independent thoughts. That's right, you have read this correctly. The Democrats are censoring the Republicans. The GOP has even been told they are not allowed to use the words, "government run health care." Write what we want you to write, or we will do it for you. The same has happened to Rep. John Carter (R-TX), Kevin Brady (R-TX), and Joe Barton (R-TX). How the censorship was accomplished was through the franking approval system (Franking Commission). This type of strong arm tactics by the Democrats should even have lefty voters concerned - because once the freedoms start being taken away from one group, other groups are always next. The thought police will take care of those GOP scum soon enough. You will be next, "whether you like it or not" (Gavin Newsom, Mayor of San Francisco, declaring Gay Marriage was coming to California, November, 2008). Neda has become the icon for the drive for freedom in Iran. Neda was a 27 year old woman shot to death on June 20 during the riots in Tehran. Her death was filmed and circulated across the Internet. Now, her name is the rallying cry for the opposition to Iran's brutal government. Thousands of Iranians were gathered around Neda's gravesite changing "Neda Lives!" As the memorial ceremony grew, Iranian police fired tear gas and beat a number of the protesters in order to disperse them. This new wave of unrest exhibits the opposition's continued drive for freedom, regardless of the crackdown, using the government's intolerance of their movement as kindling for more eruptions of protests. The episode at Neda's gravesite comes less than a week before President Mahmoud Ahmadinejad is inaugurated. Demonstrations drawing thousands later spread to other parts of Tehran. As in the last string of protests, police fired tear gas, shots in the air and paintballs at the hundreds of protesters. Most Trusted News . . .
Walter Cronkite was often called the most trusted newsman in America. Now that he has passed away, I began to wonder if there was a replacement. Is there, now, in today's wide world of news, a name more trusted over all of the others? Names like Dan Rather, Tom Brokaw, Bill O'Reilly, Larry King, and Charles Gibson are people that come to mind that America may consider. Brian Williams might be an outside shot. My favorite used to be Brit Hume before he stepped down. None of the alphabet network anchors, be them among those listed above, or not, impress me a bit. In my research, however, the answer to the question was stunning. When I entered the key words "America's Most Trusted Newsman," the name that came up is not even a newsman - or at least he is not to sane people. According to The Huffington Post, and a myriad of other sites, based on an online poll, the most trusted newsman is . . .
Jon Stewart of the Daily Show. How many of you slapped your forehead and rolled your eyes? That's right, the goofy wannabe of Comedy Central topped the poll. The guy is a frickin' idiot. He is a comedian with leftward leanings, and an uncanny ability to say B.S. without tipping his hat that what he is saying is B.S., even though he is out front in telling everyone that everything he says is for entertainment, and has little or no news value whatsoever. I mean, he advertises what he vomits is humor, and a bunch of crap, but people out there actually believe that his broadcasts are somehow newsworthy. Do people actually tune in to The Daily Show to learn the news of the day? Heck, I hardly even watch news on television anymore, since it is so biased - and that includes much of the Fox Network too. I actually had a conversation with a leftist acquaintance recently that told me Steven Colbert was the only conservative he could stomach to watch. Are some people that stupid? Gosh, I hope that people with that low of a mental capacity does not rank as the majority. Then again, Obama got elected. Hoo boy, this is getting scary. These American citizens, educated by American schools, actually believe the idiocy. Kids, I know the lunatic public school system ruined you for life, but listen carefully: Colbert is a libtard pretending to be O'Reilly-ish as a joke. Bill O'Reilly isn't even a Conservative, though he is definitely not a far left crazy. And Jon Stewart, your champion of news, is a comedian, and a very liberal one at that. He only got the gig because the other guy, Greg something or other, decided to take a stab at alphabet network late night. Most of what Jon says is idiotic, void of facts, and not meant to be taken seriously. It's a big frickin' joke, and for some reason, you have fallen for it. Take the jar of kool-aid away from your lips, take it back over to the kitchen, and pour it out. Oh, as an added funny, Brian Williams actually came in second in that poll. So much for the poll being worth trusting. Whew, at least the top two weren't one of those major scumbags - Bill Maher, Chris Matthews, or uber-freak Keith Olbermann. And what a surprise - The number two freakishly liberal website Huffington Post reported this, landing at the top of my Yahoo search when I hit the button. Daily KOS would be the number one freakishly liberal website. The Daily KOS and The Huffington Post are two of the least trustworthy sites on the Internet. I suppose, then, it would be fitting that those kinds of mental midgets are reporting that Jon Stewart is a king among newsmen. What do you get when you put together a Black Harvard Professor trying to get into his home, a White cop told he is breaking into the house, and an ignorant U.S. President that has a history of jumping to conclusions? You get a joke of a Beer Summit that is obviously being used to elevate Obama once again since everything is crumbling around him. I just finished watching Sgt. Crowley's press conference after the completion of the Beer Summit between he, Professor Gates, President Barack Obama, and late entry Vice President Joe Biden at the White House. Listening to the broadcasters yapping about it, and listening to the questions and answers by Sgt. Crowley, I realized what a big joke this thing was. Obama is being portrayed like he is some kind of great moderator bringing together the White and Black halves of America over a beer. A non-racial situation has been turned into one, and the President of the United States is suddenly the great race-arbitor. The press is making a big deal over whether or not the gal who called dispatch said it was two Black men, or just two people. People are worried about if Crowley and Gates got along at the beer summit too, and what Crowley meant by saying he and Gates agreed to disagree. My response is, "Who cares?" By the way, Biden was added because they didn't want nobody feeling like a third wheel. Like usual, the Democrats are so worried about upsetting someone, or offending someone, because they see America as a nation of groups. They think we are all touchy about race, and Obama wishes America to see him (after his "stupid" remark) as a great mediator in the liberally perceived out of control war on race. We are individuals. It is up to us to be responsible to ourselves, and to others. There was no race controversy until Gates and Obama decided to make it so. Who cares if the dispatcher said the suspects were black. If she did, it was to better enable the cop to better identify the perpetrator. Stating the color of a person who is believed to break into a home is not being racist - it is simply applying indentifying factors. Who's fault is it that this became a big issue? I heard that in a poll it is pretty split. Some say Crowley's, some say Gates, other say both. I think that it really was neither of their faults. It is the fault of the idiot that asked Obama his opinion on it in the first place. Nobody knew much about the situation at that point, and it was simply an attempt to make a mountain out of a mole hill. Hopefully we are done with this garbage, but I doubt it. The most famous volcano outside of the State of Washington (Mt. Saint Helens is pretty famous in America) erupted in 1883. Krakatoa exploded with a force 13,000 times more powerful than the atomic bomb dropped on Hiroshima, Japan by American Forces during the waning days of World War II. The eruption in 1883 killed over 36,000 people. Anak Krakatoa is a new volcano that is emerging from the remains of the former giant beast which blew itself apart over one hundred years ago. Steadily growing out of its predecessor's remains since 1927, Anak Krakatoa is currently half the size of Krakatoa was in 1883. The volcano lies between Java and Sumatra on the Sunda Strait, and has recently been providing a light show that reminds us how beautiful nature can be, and how dangerous. A repeat blast seems imminent, and locals are bracing for the worst. In 1883, Krakatoa destroyed itself when it exploded, causing a tsunami of tremendous proportions while spewing poison gases and hot ashes on the surrounding lands. Prior to 1883 there are records of volcanic activity in the same area, one eruption during the 1500s is said to have been a factor in global climate changes. In 1927, now underwater, Krakatoa sprang back to life, and a new island rose out of the waters. Three times islands rose out of the water, and was eroded away by the waters. In 1930, a fourth attempt was successful, as the volcano provided lava faster than the waves could erode them. The island was named by locals Anak Krakatau ("Child of Krakatoa"). Since the 1950s the rate of growth of the island has increased, and in 1994 the Child of Krakatoa experienced an episode of eruptions. The island has been constantly rumbling ever since, going through an eruption sequence in April 2008 that released rocks, lava and gases. The Spring of 2009 began the most recent episodes of rumblings, with lava spewing, and the island growing. So far this year plumes of smoke and the release of lava has contributed to the darkening of the skies, and the growth of the island. I wonder how long it will take the liberals to find a way to tax the volcano for contributing to the green house gases being added to the air? For spectacular photos, go to the link below at The Daily Mail. Barack Obama figured the selling out of America through a Health Care takeover by the government would occur as smooth as silk. He figured he could sell slavery in the guise of "needed assistance" with ease, while convincing the populace that with more slavery comes freedom. It isn't going as well as King Obama once thought. Now, this whole health care thing is getting personal. President Obama's pitch is now that a sweeping overhaul in the health care industry will help the people of America, and will be sure to include consumer protections. But how do you protect the consumers when the brightest minds in America begin to shy away from medicine because the profitability has been killed by government intervention? How do you protect consumers when insurance companies begin to increase rates because of a severe loss of customers they know they will never get back once more than half of their customer base runs over to Obamacare? How do you protect consumers when bureaucrats in Washington DC begin to issue "priorities" based on your behavior, and can deny you life-saving surgeries so that they can give it to somebody else that just jumped into line, but is more deserving to live? 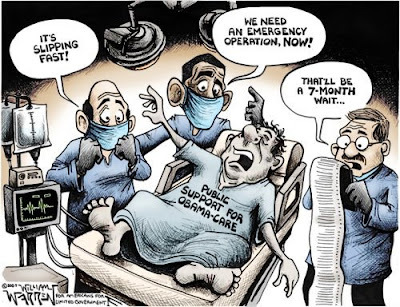 How do you protect the consumer when wait times for critical care increases because there are less doctors, less incentive to give quality care, and a bunch of government workers deciding who gets what, when? How does the government protect the consumer when the government is the problem? Rather than setting annual caps on how much insurers can charge consumers for out-of-pocket expenses, how about offering them tax breaks for bringing those charges below a certain number? Rather than barring insurers from refusing coverage due to pre-existing conditions, how about granting the insurers incentives to accept such patients into their system by implementing a relaxation in particular fee schedules should the insurer accept these patients, or tax deductions for each patient accepted that falls under this category? Rather than trying to control the industry, how about incentivising it? The way to bring down the cost to consumers is not to increase cost to the insurance companies. Increased costs to the insurer will be transferred to the consumer. The way to decrease the cost of medical care for the consumer is the decrease the cost of doing business for the insurers and the health care providers. Ultimately, in his implementation of a government paid health system, Obama will push the private industry over a cliff, and the government will become the sole provider of coverage. As a result the cost to many will go down, but taxes will rise across the board, and the quality of care will drop like a rock. In the name of affordability, are we willing to turn the greatest medical system in the world into one that can barely compete with the medical care in Third World Nations? People will die because rationing (you know, giving people priorities based on their behaviors, age, body type, and benefit to society) will only allow care to be given to the youngest, most productive members of society. Private medical care will only be available to the richest people (so much for closing that gap between the rich and the poor, Mr. President). In the end Government will have the ultimate power over you. They will be able to decide whether you live, or die. The Democrats know this will be the ultimate result. This is what they want. Obama's stupidity is not by accident. Government control over the populace by putting a socialistic system in place is the goal. They understand that a totalitarian socialistic state must be put into place. Liberals believe, however, that it is essential in the evolution of humanity, and that eventually a big government system will magically melt away, giving way to a world where we won't need government at all - where society becomes some sweet, peaceful place where everybody lives happily ever after - by the way, this utopian society they are striving for is called COMMUNISM. And we are supposed to believe this socialist state rising in America, which will inevitably become a powerful dictatorship, will happily give up its power and step aside for the liberal utopia? The goal of Obama with his so-called sweeping reform in the Health Care industry is not to make sure you have better medical care. Your protection is no more the goal of Obamacare than is Cap and Trade to help the environment. All of these policies, from the takeover of the auto industry, to the bail out of any business system they can get their hands on, is about bringing the reins of power into their own hands. The idea of all of this is for the liberal left to seize permanent power of the government. Realizing the American People would never allow this willingly, the Democratic Party (and much of the GOP) has become populated with accomplished liars and thugs. It was no accident when Franklin Delano Roosevelt said, "In politics, nothing happens by accident. If it happens, you can bet it was planned that way." Barack Obama has retooled his speeches, just as he did during his presidential campaign. He was the most liberal candidate in the hunt for the presidency, and we all knew it, yet he fooled a majority of Americans by sounding conservative - offering tax cuts, and even sounding a little less liberal when it came to the social issues. Obama knows from eperience that the truth will not work, so he must now convince folks that Obamacare is good for them, even though in the long haul it will be disastrous for America. 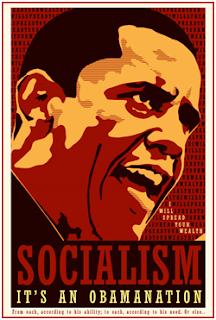 He must use lies to convince us to allow him to implement the disastrous system of socialism. His speeches about this monstrosity of a health care bill that the legislators aren't even going to read are becoming rosier and more reassuring with each day. He wants it passed, and he wants it passed quickly, before anyone realizes the long term damage to the American System it will cause. Remember, this is the same party of Democrats that accused Bush, and the Republicans, of moving too fast with their legislation and war effort. My, how opinions change when you have the chance to inject more statism into Washington while holding the reins of power as you change America into a socialist state. How insane is it that Democrat politicians are arguing that they have no need to read any bills before voting on them? House Judiciary Chairman John Conyers (D-Michigan) actually said during a speech at a National Press Club luncheon that he sees no point in lawmakers reading the health care bill. Not only is there no time, but they would need to have two lawyers with them to interpret it. Aren't a large portion of politicians lawyers? Suddenly they can't understand their own bills? Conyers specifically said, "What good is reading the bill if it’s a thousand pages and you don't have two days and two lawyers to find out what it means after you read the bill?" Two days? Why rush such an important piece of legislation? Take a load off. Take a few weeks to read it. Voting "yes" on a piece of legislation without even knowing what is in it is asinine one would think. Then again, liberals have done worse. I have repeatedly told people that Barack Obama chose Sotomayor as his judiciary pick because she is a perfect reflection of him, right down to the racism. Don't believe me that Obama is a racist? Have you read "Dreams of my Father?" My opinion catches a lot of flack, and that is fine. I know what I see. Problem is, many folks think that only white males can be racist. Everyone else has an excuse for their racism. When someone agrees with me, but come to their conclusion for a different reason, it always catches my attention. When it comes to Obama being a racist, the opinion came from a place I hardly expected. The accusation came from Israel. The fuel for the racist charge against President Obama comes regarding his policies against Jewish construction in eastern Jerusalem, and the West Bank. In a rally in front of the U.S. conslate in Jerusalem, 2,000 Israelis proclaimed that Obama is a racist, and that Obama's envoy to the conflict over Jerusalem, and outer territories, George Mitchell, needs to go home. "Obama should not be pressing Israel to compromise and freeze building in Judea, Samaria and eastern Jerusalem," a protest organizer by the name of Yaacov Steinberg told World Net Daily. The belief is that Obama's policies, if followed by Israel, would show Israeli weakness, and embolden Palestinian terrorists. Obama dictating to the Jews in the area where they can and can't live didn't go over too well either. Mort Klein, president of the Zionist Organization of America, said of the issue, "It's absolutely an outrageously racist policy. Especially in light of how Obama should be sensitive when it comes to anything that would remotely constitute discrimination of people based on ethnicity or religion." Israeli Prime Minister Benjamin Netanyahu strongly rejected the American demand. "Imagine what would happen if someone were to suggest Jews could not live in or purchase [property] in certain neighborhoods in London, New York, Paris or Rome," he said. Beer Party At The White House! 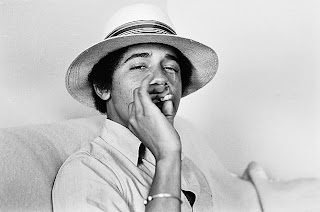 Feeling bad that Obama was stupid when he called the Cambridge Police Department "stupid," and figuring he can get everyone to "just get along" over a couple of beers, and his charming charisma, Obama has declared that on Thursday he will host a "Suds Summit" with Professor Henry Louis Gates, and Cambridge Police Sergeant James Crowley. Nobody could come up with a "one size fits all" beer (liberals aren't too big on individual choice), so Obama had to settle for allowing everyone to individually choose what they want to drink. The final tally? Obama will drink a Bud Light, Gates will have a Red Stripe and Crowley a Blue Moon. As long as the weather permits, the three will enjoy a cold one together on the picnic table next to the White House's new swing set around 6:00 o'clock in the evening Thursday night. I am not much of a beer drinker. I have more fingers than the number of beers I drink per year. Nonetheless, I have had enough beers in my lifetime to be a good judge of good beers, and there is not a single light beer on that list (okay, okay, Michelob Light and Amstel Light are drinkable, though not nearly as good as having a full bodied beer with hair). Dark lagers and Mexican beers usually catch my fancy. Here is the interesting thing about light beers: Dropping off a couple calories doesn't necessarily make a beer less fattening. Alcohol slows down your metabolism, so dropping a few calories may seem noble, but does not actually address the problem. Besides, light beers, because of that loss, has a weaker, almost watered-down taste to them. Light beers are sort of like light cigarettes - not necessarily any better for you, but a definite compromise on taste. I quit smoking a few years ago, and haven't drank more than two beers in one night since I was in my early twenties, so I am not saying to folks it is good to smoke up and drink up - but, if you are going to enjoy these products, why sacrifice taste for a lesser product that does not save your gut, or lungs, as they claim? Anyway, the whole point of this post is not really about beer or smokes. Heck, I don't even care if the president is having this little get together - though I am chuckling because it makes me wonder if he thinks he can do the same with Ahmadinejad and the midget in North Korea with wonderfully peaceful results. The point of this all is it is funny that Obama likes light beer. Like his presidency, light beer comes across weak, watered down, and the "less calories is less fatty for you" claim is a big fat lie, but people buy it anyway. A recent post right here on Political Pistachio, Definition Natural Born Citizens, drew a lot of interesting feedback. Within a few hours I had a whole handful of comments, every one of them filled with name calling and profanity. I received Emails too from people angry I was willing to write about such a topic, again. Interestingly, not a single comment or Email addressed what I actually wrote in the post. The title of the blog post was enough to anger the hateful liberal tools. But, based on the fact that none of the attacks addressed what I wrote, it told me they were reacting to the subject matter, not about what I actually had to say on the topic. (I will admit, however, that on Facebook one of the commenters doubting my position did address what I had to say directly - therefore, telling me that she, at least, read the entirety of the article). How objective can one be when at the mere mention of a topic the blood veins in the neck begin to burst, but none of the evidence presented is even considered. Sounds like Congress voting on the nationalization of the private sector - nobody is reading the bills, they are just voting for them because Obama said to. "Just a couple days ago, the officials in Hawaii responsible for keep track of such things have stated that the birth certificate is correct, and have affirmed over and over and over again that Obama was born in Hawaii. You people are just f***ing jokes..You do know that.. don't you? We're pointing and laughing at you most of the time.. but every so often, you get irritating as f**k as well. This who stupid-as-f**k "birther" thing is just irritatin now. You're not "touching a nerve". You're just stupid as f**k, pushing the same debunked stupid crap over and over and over." And this is a person that also likes to criticize my writing skills. His writing is barely intelligible. Notice, not a word was presented in his inane comment about what I specifically wrote. His offering was just a reactionary, recycled, eye-bleeding, maniacal, angry attack filled with talking points fed to him by all of the other crazy liberals. The mere mention of the words "Obama" and "birth certificate" in the same sentence makes these people's heads explode. Notice, too, they are now calling folks who question Obama's eligibility "birthers" in an attempt to denigrate the issue (same tactic they use on just about everything else, too - jeez, they never change). Non-birthers that launch into profanity-laced rants of hate and discontent anytime someone dares to speak out against their precious Obama, I have a message for you: "They have trained you well. You are like a show dog rolling over on command." How does it feel to no longer be an independent thinker? I am still wondering what happened to those Hippie Liberals that used to proclaim that they would defend my right to free speech no matter what, despite their disagreement with me. I guess their willingness to defend the freedom of political speech only applies when they say it does. Now, if conservatives dare to voice a few words of dissent against the Obamessiah, we are attacked in ways that are so vile and hateful that I feel more sorry for these people, than feeling any anger. The point of view I took in that article that these liberals failed to catch (and I am assuming by this point in this particular post none of them are still reading) was that it may be very well that whether or not Obama was born in Hawaii does not matter. Don't get me wrong. I think there is something being covered up based on Barack's shady response to this issue, but what if the definition of a Natural Born Citizen is such that by having a non-citizen father, it doesn't matter where Obama was born because in order to be a Natural Born Citizen both parents must be American Citizens? Having a parent from another country opens up the opportunity for dual loyalties, and the founding fathers desired that the president's loyalties be 100% to the United States of America. So, what has all this to do with WMDs? If you will remember, the Democrats claimed that Bush's whole excuse for going into Iraq was Weapons of Mass Destruction. When no actual WMDs were produced, the Democrats and liberals claimed that the absence of WMDs was proof the WMDs never existed. Verbal testimony by General Sada, who was formerly of the Hussein Regime, that the WMDs were moved to Syria in 2002 was rejected by the Left. Verbal verification was not good enough. Then, when evidence was found, primarily mustard gas, the liberals argued that the chemical weapons were not the real thing. They wanted proof of major weapons of mass destruction, not a history of using such weapons, or evidence of mustard gas. Regarding Obama's birth certificate, note that no actual birth certificate has been produced, but regardless, the Democrats and liberals claim that Obama's word is proof enough of his eligibility. Verbal testimony by Obama's paternal grandmother that she was in the delivery room in Kenya when Barack Obama was born is not good enough, but the testimony of a Hawaii state worker is enough for them to declare that without a doubt Obama was born in Hawaii. 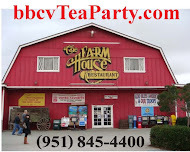 When a birth certificate is produced, it was not produced by Obama, but by a liberal website, and it is a computerized short-form that does not include pertinent information such as the name of the hospital, or the name of the attending physician. However, they were willing to accept this questionable birth certificate as undeniable proof of eligibility, regardless of a history, Obama's actions to fight the issue, or mounting evidence pointing to the contrary. In short, when it comes to WMDs, they need to see the real thing. When it comes to Obama's birth certificate, they don't. Verbal testimony by a high ranking official in Saddam Hussein's government was not good enough for them regarding the WMDs, nor is the testimony of Obama's paternal grandmother regarding the location of Obama's birth. However, a state worker's testimony that she has "seen" the real birth certificate (while still not producing the real thing) is good enough for the liberals. Proof of mustard gas weapons of mass destruction was unacceptable to the liberals, but a computerized, incomplete birth certificate provided by a biased liberal web site is absolutely acceptable as the real deal. The history of Hussein's past use of WMDs was not enough to convince the Democrats that the presence of WMDs in Iraq may have been possible. A lack of history of Obama's past, and the sealing of all of his records, is not enough to convince Democrats that it is possible he is not eligible. I do not believe that Barack Obama is the anti-Christ. In fact, I do not believe the identity of the anti-Christ will be revealed until after the advent of the rapture of the Christian Church. There are no biblical passages that convince me otherwise. Even Satan himself does not know the indentity of the anti-Christ. After all, Satan is not omnipotent, and therefore cannot possibly know the details of the future as does God. Since Lucifer does not know the future, he could not possibly know the identity of the anti-Christ. That said, I found the following video very fascinating. If the language peculiarities mentioned in the video are true, it makes one wonder deeply about the significance of one, Barack Hussein Obama. Growing up one of the truths I learned along the way is that if people start freaking out with hateful responses it means you have probably touched a chord. When you touch a nerve in that manner, more often than not it means there is a speck of truth in what was said. This may not always be true, but often it is. In an Email thread I am a part of a blog post by Third Wave Dave called "A CHALLENGE TO BILL O'REILLY, ED MORRISSEY, AND SENATOR JIM DeMINT" became the topic of discussion. In the piece Dave simply asks that if Obama's birth records are in order, and Obama is a Natural Born Citizen, then why is it that with the last group of presidents each and every one of their birthplaces are known, to the detail, in the sense of exact address, attending physicians, etc., but with Barack Obama, all we have is a computerized birth certificate provided by websites (rather than by Obama) that gives only the city of Honolulu, Hawaii. Granted, in an attempt to verify Obama's birth in Hawaii, Dr. Chiyome Fukino even recently proclaimed that she has seen the original birth records confirming Obama's birth in Honolulu. (Turn on Sarcasm Pump #1) - Oh, well, since some Doctor claims to have seen the documents that are not being released, that settles it. He must've been born in Hawaii after all! Of course nobody is making mention that if Dr. Fukino's statement is true, she broke Hawaiian law by violating Hawaii's Revised Statutes Section 338-18, which pertains to the disclosure of records. In response to the "A Challenge!!" Email, one of the folks on the list responded with concerns, asking ". . . what if it is proven conclusively that B-HO was not/is not eligible to be president? What then? I know what should happen; I'm asking what will be the consequences? There's the real challenge, and that could be why some are on the right are ridiculing those of us with questions, trying to get us to STFU." In a short answer, there would be blood in the streets. If Barack Obama is not eligible, every piece of legislation he signed will be null and void, and he will be guilty of criminal actions. After all, it would mean that he willfully lied, and misled the American People. In fact, if Obama was found to be ineligible for the presidency, he could be tried for treason. I don't know if Barack was born in Hawaii, Kenya, or Mars. I wasn't there when he was born. What makes me pay attention regarding this issue is the fact that Obama's response to the allegations has not been to simply provide proof. Instead a computerized version of a short-form birth certificate appeared on liberal websites, and Obama sealed all of his personal records while hiring a dozen lawyers to fight the allegations. Hardly the actions of an innocent man. However, something to consider further stems from my conversations with my good friend, the U.S. Constitution expert, Loki. Does it matter where Barack Obama was born? Notice the words: Natural Born Citizen. A citizen is simply someone born in the United States, someone who has been naturalized, etc. Notice the 14th Amendment does not say anything about "natural born citizen" in its definition - it is only about being a citizen. This is because the 14th Amendment was written specifically regarding the expatriated slaves. To understand the true nature of what a natural born citizen of the United States is, one must go back through history, and ultimately, to "common law" of the time period the U.S. Constitution was written. Common Law, at the time of the founding of this nation, indicated that a Natural Born Citizen was an American born from two American Citizen Parents. The reason for this was to combat any possibilities of dual loyalties. Since Barack Obama's father is Kenyan, based on Common Law of that era in regards to being a Natural Born Citizen, Obama is not a Natural Born Citizen, and no birth certificate from Hawaii will change the fact that Barack's father was a citizen of Kenya. A reply from a different person in the thread came quick, beginning with the salutation, "Hey, Retards. . . "
Without relaying his complete response, I am sure simply by the greeting it is apparent to you what the reply essentially said. Why does questioning the legitimacy of Barack Obama's eligibility to be president make me a retard? Should we not question when we believe foul play is afoot? The Left sure didn't hesitate from accusing Bush of much worse during his presidency. Furthermore, if you understand my explanation of the definition of natural born citizenship, it would also mean that conservative champion Bobby Jindal, a son of immigrant parents, would not be eligible to be president either. After all, the law applies equally to all persons, right? Why would I inflict that kind of potential damage on one of my own favorite politicians if I didn't believe my assessment to be true? It is one thing that Barack Obama is asking America to follow him as he steps off the edge of a cliff. But for America to do so following a president that may not be eligible in the first place is astounding. For Americans to go on the warpath, and enter into a rampage of name calling and hateful attacks against people for merely bringing up what I consider to be a legitimate question is downright shameful. The radio segment I have been asked to be the guest on is being headlined as "The Passions and Persuasions of Political Pistachio Host and Producer, Douglas V. Gibbs." 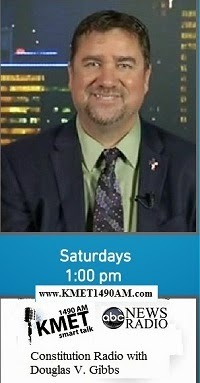 The program is "Ramble and Rumble with Rabbi," hosted by Rabbi D.F. Eukel, the radio rabbi. 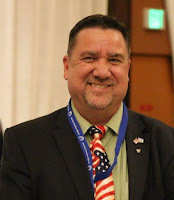 The program runs live Wednesday morning (August 29, 2009) at 4:00 AM to 5:30 AM Pacific (7:00 AM to 8:30 AM Eastern), and I have been asked to be on the show as Rabbi Eukel's guest during the final half hour segment. Visit the webcast of the program on Ramble & Rumble with Rabbi live, or you can catch the archive later. Give it a rest, Barack. . .
Israel Regarding Iran: "Whatever It Takes"
The Associated Press is reporting that Israel has announced an even harder stance against Iran's nuclear program. Israel has continually voiced the opinion that the Obama Administration is naive about Iran's intentions, and so Israel plans to take it upon herself to move on Iran's nuclear facilities. Israeli Defense Minister Ehud Barak is not ruling out any military action, and says that Israel is considering a pre-emptive strike to take away Iran's ability to obtain nuclear weapons. "No option should be removed from the table," said the Israeli Defense Minister in a press conference. The American Government currently has a different opinion on how to deal with Iran's nuclear aspirations, desiring to take a diplomatic road first. Since Israel considers itself the prime target of any eventual Iranian nuclear bomb, it has become apparent to the Israelis that it is up to them to stop Iranian nuclear aggression before it begins. Iran has continually claimed its nuclear aspirations are for domestic purposes. In a continuance of the Islamization of Europe, in London the police department will be ensuring that officers used in an investigation are of the same religion as the neighborhood the situation occurred in. Sharia Courts are already being allowed to supersede British Law in Muslim communities, but now Muslim officers are being added with the intention of investigating "honor" killings and forced marriages with officers that better understand the customs of the religion. Chief Supt Joanna Young said of the plan, "It's political correctness gone mad. We are talking about the creation of a separate force within a force." The United States Constitution was written to limit the powers of the federal government. Protecting the rights of the sovereign states was a primary goal of the founders when they wrote the document. They plainly intended to strictly limit the prerogatives of the federal government to those powers explicitly assigned to it in Article I, Section 8 of the U.S. Constitution, while reserving to the states all other powers not explicitly forbidden them in Section 10 of Article I. History is filled with controversy over the concept of state's rights. Prior to the American Civil War one of the arguments in support of the sovereignty of the states was that a state could legally refuse to carry out federal enactments that they regarded as unconstitutional encroachments on their sovereignty, and there was nothing the federal government could do about it. Constitutional Originalists of today still follow that line of thought. Opponents of state's rights argue that the U.S. Constitution is more of a set of guidelines that can be liberally interpreted, asserting that the federal government has "implied" powers that are not necessarily explicitly stated, but are in accord with general powers given by certain statements within the U.S. Constitution, such as the duty of the government to "provide for the general welfare." Approaching the War Between the States, the sovereignty of the states became the primary issue that eventually led to the bloody civil war. Slavery was but a minor ingredient at that point, and was not considered a major issue regarding the war until the Emancipation Proclamation was read by President Abraham Lincoln. The Emancipation Proclamation, while holding no legal powers, was actually a politically motivated move intended to back Britain off from supporting the Confederate States. By making the Civil War a noble war of the abolition of slavery, rather than simply a war over state's rights, Great Britain, who had outlawed slavery long before, bowed out quickly for fear of being criticized for siding with the slave states in a war now labeled as a war to free the slaves. Abraham Lincoln used strategies that were not constitutional to hold together the union, and he encroached on the rights of the southern states, which resulted in the ultimate move to ensure the sovereignty of the states, secession. He was willing to circumvent the rule of law to achieve victory, which is why among many conservative historians Lincoln is referred to as the "Benevolent Dictator." Many would argue Lincoln, and the presidents before him, brought on the American Civil War by not abiding by the Constitutional concept of state's rights. After all, an abolition movement had already begun in the southern states, and though it may take an extra decade or so, slavery would have been abolished, most likely, without a shot ever being fired. Following this line of thinking, one could say that the American Civil War was avoidable, from a slavery viewpoint, had the federal government decided not to step on state's rights, and force the hand of the southern states into declaring independence. Nonetheless, the federal government exercised unconstitutional control over the states, and the American Civil War broke out. During the war it looked as if the Confederacy had a chance to win, though many historians point out that even if the southern states had succeeded in becoming a separate nation, ultimately the United States would have rejoined into a single entity eventually, most probably due to the need to unite for the cause of protecting the states from foreign enemies. The war, however, after the British blockade was broken through the underhanded political strategy of the Emancipation Proclamation, progressed to its conclusion, ending in the defeat of the Confederacy. This defeat of the southern states in the Civil War was the end of the final attempt, and any future attempts, of states to use their sovereignty to keep the federal government under control. As the twentieth century approached, states seemed to accept the death of their power to veto or otherwise contravene enactments and policies of the federal government. In 1913 the Federal Reserve Act, implementation of the Federal Income Tax (16th Amendment), and the elimination of state representation in U.S. Congress with the passage of the 17th Amendment (which changed the vote for the U.S. Senate from that of the State Legislators, to a direct vote by the people) represents, according to Constitutionalists, the year the federal government jumped the divide, and moved away from the Constitution's original intent more so than anytime in previous history. With the removal of the state's representation in the U.S. Government via the U.S. Senate, it seemed the only recourse states would have there on out would be an Article V Convention, or a direct declaration of sovereignty. With the passage of the Federal Reserve Act, the central bankers of Europe realized that, after looking back on their own 220 years of experience with the Bank of England and other European central banks prior, American indebtedness would eventually grow so large that the central bankers would eventually own the American nation, and the federal government would be able to seize control of the populace under the guiding hand of the bankers. During the first three decades of the 1900s it was difficult to determine if it was the Republicans or the Democrats that were more in favor of a strong, central federal government. Once Franklin Delano Roosevelt took office, however, it became apparent that the ownership of a policy supporting an intrusive big federal government belonged to the Democrats. During his presidency, FDR extended federal powers far beyond what was granted to the federal government under the U.S. Constitution, and these dangerous policies were routinely denounced by conservative opponents of socialist legislation. Roosevelt's policies were seen as intrusive on the American People, and as obvious abridgments of states' rights. Franklin Delano Roosevelt's successor, Harry S. Truman, continued the policy of expanding the prerogatives of the central government, ignoring the demand of a strict protection of state's rights by many in his own party. The "Dixie-crats," southern Democrats that supported state's rights, left the Democratic Party and joined the Republicans. The Dixie-crats would later demand compromises in the Civil Right's legislation that the Democratic Party was strongly against as well. While the Republican Party was firmly in support of Civil Rights legislation, the newest members of the party, the former Dixie-crats, demanded that such federal legislation not be used to compromise state's rights in the matter of civil rights. Democrats, meanwhile, filibustered against the Civil Rights Act of 1964 (after also opposing similar bills in 1957 and 1960), and to appease both the Democrats, and the newly Republican Dixie-crats, the bill was adjusted, and then was passed into law on July 2, 1964. In the end, it was the Republicans that were largely responsible for the enactment of Civil Rights Laws, but it was the Dixie-crats in the party that ensured the laws were written in such a way that federal intrusion on state's rights were at a minimum. Republicans have since reversed much of the federal entitlement programs, which is also an issue that encroaches on state's rights, by implementing a system of block grants to the states. This conservative approach underlay the landmark welfare legislation of 1996 by the Republican-led Congress. 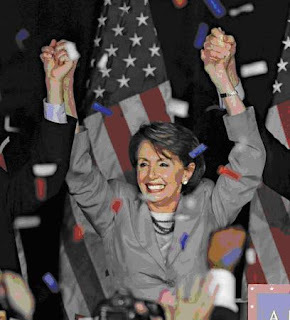 After balking the legislation twice, Democratic President reluctantly signed the Welfare Reform bill in August, 1996. Now, with the Barack Obama Administration enacting socialist legislation that even Franklin Delano Roosevelt was not foolhardy enough to enact (or maybe he simply ran out of time and support), the issue of state's rights has arisen again. 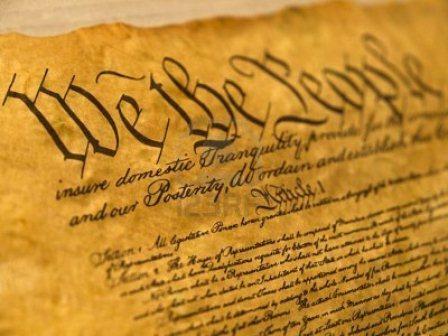 Lawmakers in various states have now introduced resolutions declaring state sovereignty under the Ninth and Tenth Amendments of the U.S. Constitution States. Montana and Tennessee (and possibly Utah to soon follow) have passed laws designed to get the federal government out of their business regarding firearms. In Tennessee, General Assembly Bill 1796 (Tennessee Firearms Freedom Act) states that "any firearms or ammunition manufactured within the state and legally owned and kept within the state by citizens are not subject to federal law or federal regulation, including registration due to provisions in the Second, Ninth, and Tenth Amendments to the United States Constitution." The intention of the legislation is to run and end-around pass the Commerce Clause, of which the federal government constantly uses, against the original intention of the clause, to poke its nose into state issues. The federal government, completely ignoring the U.S. Constitution, has responded in writing telling Tennessee that the state law, despite the wording of their state law, is not legal. Specifically, the letter stated, "As you may know, federal law requires a license to engage in the business of manufacturing firearms or ammunition, or to deal in firearms, even if the firearms or ammunition remain with the same state. All firearms manufactured by a licensee must be properly marked. Additionally, each licensee must record the type, model, caliber or gauge, and serial number of each firearm manufactured or otherwise acquired, and the date such manufacture or other acquisition was made. These, as well as other federal requirements and prohibitions, apply whether or not the firearms or ammunition have crossed state lines." The U.S. Constitution dictates that the federal government cannot infringe on the right to keep and bear arms (Second Amendment), and that the issue is up to the states to pass laws regarding. Also, it is illegal for the federal government to overturn or overrule state laws if the state law does not violate Article I, Sections 8 and 10. In other words, the federal government's position regarding Tennessee's new law is unconstitutional. Governor Perry of Texas has also raised the possibility of a state's rights showdown over Obama's health care plan, indicating that states and governors need to stand up and say "no" to this type of encroachment on the states with their health care. What we are seeing, as the federal government under the control of the liberal Democrats, and Barack Obama, makes moves to trample on state's rights, is an increased demand for states to exercise their rights, and to resist the continued federal encroachment on state and local authority. Many Constitutional Originalists I have spoken to see this as an issue that is destined to explode, and one that will result in a showdown between state sovereignty and federal control over the states. Some would call that the next American Civil War. New World Order coming to your town - The U.S.S.A. When I first heard about Barack Obama saying a Cambridge, Massachusetts' police officer acted stupidly in an arrest, I did not write about it because, like Obama, I didn't know the full story. When it turned out the police officer was White, and the suspect was a Black Harvard professor, it made my ears perk up, wondering if racism was going to be evoked for this one. As expected, Harvard professor Henry Louis Gates Jr. claimed he was racially profiled. When asked his opinion on the matter in a press conference, Obama had apparently fallen for the racial plea, and jumped to conclusions, basing his answer completely on the testimony of Gates, rather than on the facts. Still, I kept my keyboard silent on the issue. 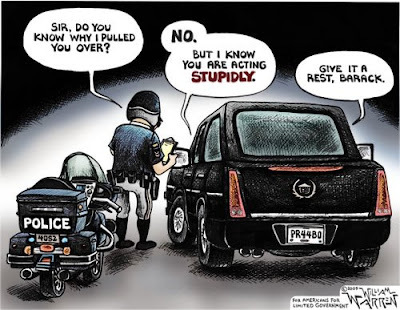 When the news that the policeman followed procedure in his arrest of Harvard professor Henry Louis Gates Jr., and that the local police officers union had determined that there was no evidence the arrest was race-based, which made it necessary for Obama to apologize for jumping to conclusions without learning all of the facts, I chuckled. It was a typical move for someone like Obama. After all, being a liberal, it comes as second nature for far left liberals to assume things without having all of the facts in front of them, or even using the facts properly, for that matter. It was comical watching the Democrats scramble to try to keep their messiah, Mr. Obama, looking good and intelligent - despite his stupid remarks. Still, I refrained from writing about the situation, though I did mention it a couple times on my radio program. The straw that broke the camel's back, however, was when I learned that this is not the first time Barack Obama has tangled with the Cambridge Police Department. Apparently, Obama has a history with the department dating from his college years to as recently as the launch of his presidential campaign. Remembering back to the presidential campaign, I remember when an issue regarding a whole slew of unpaid parking tickets became the subject of many conservative talkers and writers. 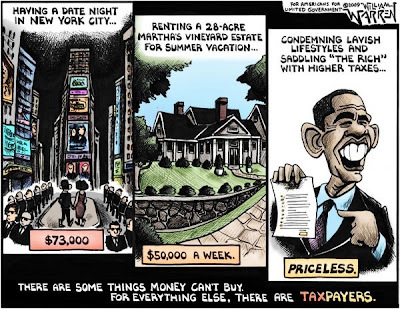 Specifically, Obama had 17 unpaid parking tickets that he wound up paying just weeks before he announced his bid for the presidency. One would think that would mean that Obama has no love lost for the Cambridge Police Department. After all, they were a thorn in his side when he was younger, so surely they must automatically be guilty of acting in a racist manner against Mr. Gates, right? What is really interesting is that while Obama was a law breaker (with all of those unpaid parking tickets), he practiced law in Chicago, served as an Illinois State Senator, and as a United States Senator. As John LeBoutillier of Newsmax commented, Obama during this time as a man that was supposed to be a champion of the law "allowed these almost-two-decade-old signs of his disdain for the law to remain unpaid." Now, knowing that the Cambridge Police Department was the issuer of those parking tickets, it makes one wonder if Obama jumped to conclusions regarding the department's arrest of Gates based on his past experiences with them. And if he is willing to jump to conclusions like he did in this situation regarding the Cambridge Police Department, without knowing all of the facts, what other conclusions is he jumping to while in the Oval Office, while pretending to be a capable leader of the free world? As Sarah Palin's final day as governor of Alaska passed it was interesting listening to the pundits try to figure out her strategy, or reasons for stepping down. My local CBS Television News was proclaiming over and over again that nobody knows why she resigned as governor of Alaska, and then proceeded to play clips of a couple people, one being Sarah's father, saying, "I don't know what she has planned for the future." Not knowing what Sarah Palin is planning for the future is not the same as not knowing why she stepped down. The clips were right, however. Nobody knows for sure what Sarah has planned for the future. Speculation, and the hopes of conservatives, circle around the possibility that her future plans include preparing for a national run for office. One thing is for sure, Sarah Palin energized Republicans last year in ways that none of the presidential candidates were able to accomplish. The Republican Party seemed to have purpose again, rather than being satisfied with itself acting like a light beer version of liberalism. Sarah Palin's energy would be a welcome return to the national stage, especially to possibly halt the GOP's continued leftward slide. The Party of Reagan is nothing like it was, and began a deadly journey into self-destruction during George Herbert Walker Bush's presidency, moving leftward ever since. A little conservatism in the form of a firecracker from Alaska may just be what the party needs. . . again. The liberal left Democrats and biased media proclaim that the Republican Party lost the election in 2008 because it has swung too far to the right. It literally cracks me up when liberals and moderates claim that kind of madness. In reality the Republican Party has been suffering from a rapid move away from its conservative roots, becoming more like the Democratic Party with each passing cycle. The Republican Party ceased being the party of original conservative ideas, and has stopped having strong Constitutional stances on the issues. Critics of conservatism say that the GOP has a better chance to win the presidential election with a wishy-washy moderate, than a conservative. Newsflash, the GOP tried that in 2008, and lost. In fact, if McCain had not have chosen the quite conservative Sarah Palin as his running mate, the loss suffered would have been even more severe. Part of the leftward lean of the Republican Party can be attributed to both Bush Administrations who believed in something called "Compassionate Conservatism." Compassionate Conservatism is hardly conservative at all, and in reality was just another name for big government spending under the guise of conservatism. In fact in pursuit of such an idea, Dubya teamed up with Teddy Kennedy to create the disastrous "No Child Left Behind" Act, which placed big government even more front and center in an already ailing public school system. Also, the rule of law seems not to mean much to these "Compassionate Conservatives" when it comes to the illegal alien issue. I am not Bush bashing, but as I did often during George W. Bush's presidency, I recognized that though there were many things I felt he did right, there were also many things President Bush failed at. During 2007 especially, I wrote about these less than desired positions of President Bush often. Honestly, among Conservatives, we all knew that when George W. Bush came into office that despite his claims of conservatism, when it came to the size of government, it was doubtful he was conservative in the least. Luckily for us, Bush at least was wise enough to understand that when faced with an act of war against the nation, as was the case on 9/11, to avoid further attack a nation must spring into military action. In all honesty, despite the liberal left's claims that the Republican Party has become the party of the "religious right," the GOP hasn't moved to the right in the slightest since the presidency of Ronald Reagan. The Democrat Party, however, has moved drastically to the Left during the same time period. When a party moves as far to the left as has the Democrats, anything not teetering on the edge of communism like they are will look like it is on the extreme right - which explains liberalism's warped view of things. In other words, contrary to popular leftard opinion, the Republicans didn't move to the right, the Democrats moved drastically to the Left - and then as they moved left, the Democrats have erroneously (through vicious propaganda) attributed the wider gap between the parties as being the fault of a GOP shift to the right. Hence, one of the reasons for Sarah Palin's popularity. As the Democrats move to the left, so has the GOP. People say we have a two-party system, but when it comes to the politics of politics, there are few differences among the elitists that hold office in the U.S. Government. Politics is no longer about being a statesman, or about feeling honored to have the opportunity to serve the people. U.S. Politics has become about gaining power, keeping that power, and worrying about the next election. Money and political greed runs rampant through Washington DC in both parties, though the Democrats own it across the board. The federal government has become a growing power-grabbing monster, expanding into our lives in ways never intended by the framers of the U.S. Constitution. Sarah Palin's popularity is more than just her conservative principles, though her conservatism plays a large part in her popularity. She is seen as a person that represents the people because she comes from the people. She is a grassroots candidate not spoiled by the cess-pool of Washington. Her primary concern is serving the people with honor. Her platform is liberty. Her goal is to maintain America's exceptionalism. For Sarah Palin it is all about the will of the people. As opposed to Nancy Pelosi who is a firm believer in the will of Congress. It is no accident that Sarah Palin has an 80% approval rating among Republicans, and nearly a 50% approval rating among independents. So if Sarah Palin is so popular, why did she decide to resign her governorship in Alaska? The relentless attacks against Sarah Palin, which includes baseless allegations that have cost the Palin Family more than half a million bucks in legal fees (along with $2 million of taxpayer money investigating the more-often-than-not bogus complaints). Amazingly, the attacks have continued, and increased, since her announcement. Such a barrage of negative attention was not what was best for Alaska, Sarah's family, or Palin's political career, so she decided it was time to spare the family, and the State of Alaska, the continued problems, and step down in hopes to either regroup, or make a determination to step down from politics permanently. 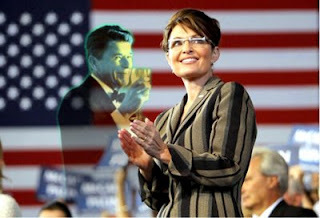 What amazes me is that The Left portrays Sarah Palin as a moron, or simpleton, supported by "dimwitted conservatives." If she is so stupid, then why spend all of the time attacking her? Why hire far left writers to do hit pieces on Sarah Palin, as suggested by Bill O'Reilly's piece at Townhall titled "Marginalizing Sarah Palin?" If she is such an idiot, why worry about her? By your very actions, liberal left, you contradict your words. Two possibilities have been given to me as reasonable answers to the question about why Sarah Palin has been such a target. Either, liberalism sees how dangerous Sarah Palin is to them, and how capable she is of re-energizing a Conservative Base that could carry the GOP into a landslide victory in the next election, or because of her faith they see this as a major opportunity to eliminate Judeo-Christian traditions by using Sarah Palin as an example of the religious right, and hammering on her, and Christian Conservatives, until like with everything else, they convince the public that their lies are the truth. All in all, the Left's preoccupation with Sarah Palin is incredible evidence of the corrupt tactics liberals are willing to use. Basically stated: If you dare oppose their ideology, you will be attacked relentlessly with unfounded propaganda until you are destroyed, or until a greater threat rises in your place. Trust me, us conservative bloggers get trolls that use the same kind of tactics. If I am so harmless, why do you care enough to attack me? Could it be because you are vile human beings who have no understanding of the words "ethics" or "standards?" President Barack Obama: "I'm always worried about using the word 'victory,' because, you know, it invokes this notion of Emperor Hirohito coming down and signing a surrender to MacArthur. . . So when you have a non-state actor, a shadowy operation like Al Qaeda, our goal is to make sure they can't attack the United States." Imagine an American Football game pitting two of the strongest teams in the league against each other. One is known for its powerful, hard-hitting game, and decisive victories, and the other is known for disrupting offenses and defenses with trick plays and unexpected strategies. In a news conference, before the big match-up, the head coach of the stronger team comes out and says, "I am careful about the word 'victory' because it brings to mind the notion that at the end of the game the other team is down in the dumps as they march into the locker room with their heads down. So, since our opponent is a team that is unlike most of our opponents, using unexpected strategies and trick plays, our goal is to just make sure they don't score a touchdown." Or better yet, let's imagine going into a game of chess with the intention of not necessarily wishing for the opponent to feel the sting of defeat, should you be victorious. Your strategy, as a result, simply becomes one of just making sure they don't capture your queen. Could you imagine playing backgammon spending all your time blocking the opponent, but not necessarily moving your own pieces off the board, mainly because you don't want your opponent to necessarily win, but you don't wish to win yourself either because you don't want your opponent to feel the sting of defeat? What Obama is saying, by his statement regarding the word "Victory," and how we should approach the War on Terror (oops, didn't the Liberals say we have to call it a man-made disaster, or something idiotic like that?) is we should play defense, without the use of its counterpart, offense. If you play offense, then you might be victorious, and if you are victorious it brings upon the opposition the horrid feeling of defeat, and surely we don't want an enemy that desires each and every one of us dead, or converted to Islam, defeated. It might make us feel guilty that they were beaten. It invokes an image of the poor, murderous crazy people coming down from their caves in Pakistan, or wherever Osama bin Laden is hiding, in a forlorn manner to sign whatever it is that proclaims they've been beaten. I read a piece recently by Warner Todd Huston that added another dimension, as well. Warner, at the beginning of the piece, asked, "When I say 'victory,' what do you think of?" The answer to Huston's question, for me, is pretty obvious. Victory is winning, accomplishment over a foe, a "warm feeling of worthy accomplishment and an assumption of gaining the accolades that accompanies victory." I wonder how many people are like Obama, where upon hearing the word "victory," they immediately conjure up in their mind feelings of how the poor loser was beaten down by defeat. I wonder if they really do feel guilt, if they truly garner such a bad feeling that on the other end of the victory was a losing party - a loser - a beaten down person or group trying to grapple with the horrid agony of defeat. When there are winners, there are losers. That is a fact of life. Losers, if they don't like losing, need to either learn how to be winners, or go play another game. However, people who think like Obama (we'll call them "liberals"), have the thought process that nobody should feel like losers, even a blood thirsty enemy. And in order for there to be no losers, there can't be any winners. If, in a game of chess, you are determined to just make sure the opponent never takes your queen, but you never make an aggressive effort to place your opponent in check-mate, eventually, you will lose. You can only play defense without offense for so long. The enemy, regardless of your feelings about "victory," has the goal to defeat you. Simply making them not attack the United States, but not achieving victory over them, gives them the opportunity to regroup and strike again on another day. An enemy like the Islamic Jihad will continue striking, over and over again, until eventually they are victorious. The only way to stop them from eventually reaching their goal is to defeat them. And when the enemy is defeated, it is called a "victory" for the winning side. "Victory" is the only word one can use. To use anything else is to leave yourself open to future attacks by an undefeated enemy. Sympathy for the enemy encourages the enemy to rise up and strike again another day, because whether you like it or not, they have no sympathy for you. On a side note, a point also brought up by Warner Todd Huston in his article, Barack Obama's statement regarding Japan's World War II surrender also shows his ignorance of history. Emperor Hirohito did not sign the document that finalized the surrender of Japan to General MacArthur. The signing of the declaration of surrender was performed by Japan’s Foreign Minister, Shigemitsu, and one of Japan's generals, Umezu. Will The Press call him on that? I guarantee you if Bush had said such a thing, they'd have been all over it. Obama's statement about victory is more apologetic than the words you'd expect from the Commander in Chief of American Forces. He can't get his history right, disrespects his own country, and has this guilt-ridden desire to go around apologizing for America's successes. It makes me sick. This attitude places the nation in a very vulnerable position. The enemy, based on the President's statements, are fast realizing that Obama does not desire victory. In other words, he refuses to play the worldwide chess game in an offensive manner. So, all the enemy has to do is keep striking, over and over again, until they eventually break through the line-up of pawns, knights, and bishops. "Victory" will be theirs, I am sure they are beginning to believe, if only they remain persistent, and on the offensive.